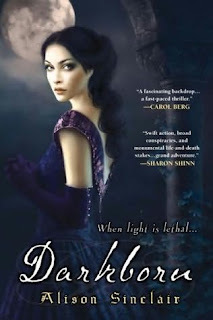 AUTHOR & BOOK INFORMATION: "Darkborn" marks the first foray in to the fantasy field by Alison Sinclair. This is not her debut but her fifth book since she has previously published four science fiction books & was an Arthur C. Clarke nominee for her third book. She is also a medical doctor by profession. Darkborn is published by ROC & in trade paperback format and it stands at 348 pages. "Darkborn" is the first installment in an as-of-yet unnamed trilogy. The novel features 10 chapters with no prologue or epilogue &is told in third person narratives. The POV shifts in each chapter are marked by the names of the corresponding character. There is also has an excerpt for the second book titled "Lightborn" and the novel features a gorgeous cover by Melanie Delon. The person featured in it might be a titular character but I have my doubts due to the presence of eyes. OVERVIEW & ANALYSIS: I had missed "Darkborn" when it was released, however a month later when I was reading another blog, I came across the cover of this book which captivated me along with the title. Usually I make it a point to never judge books based on their covers however in this case I was hooked when I read the story line as well. As a bonus, Sarah Ash had also recommended this title to me as a worthwhile read. So with these high expectations I got my hands on "Darkborn" & read it within a day. "Darkborn" features a world in which due to a curse effected nearly 800 years ago by a mage known as Imogene, the humanoid inhabitants were fundamentally & physiologically divided into two very different archetypes. This differentiation was based on the presence or absence of Light. The humanoids species were divided into the Lightborn & Darkborn. The Lightborn sub-species can only stay in the light, while in its absence their life-forces & bodies dissipate into the darkness whereas for the Darkborn the absence of light i.e. permanent darkness is the very essence of their lives. Any form or source of light can cause serious burns & eventually burn their bodies away into nothingness. This classification is a very unique one I believe & I look forward to how the author explains the classification later on in the series. Telmaine Hearne, high born Darkborn lady who married below her station to Balthasar & caused quite a stir in society. She is also a secretive mage but she abhors her power as the Darkborn unlike Lightborn view all forms of magic as anathema to their living. Ishmael di Studier, Baron of the borderlands, a scarred shadow-hunter & mage who lives his life precariously much to the antagonism of most & amusement of some. The story begins when Balthasar receives a pregnant female acquaintance just at the break of dawn. This is a very dangerous situation as the Sun rays can be fatal to any Darkborn. Tercelle Amberley is the pregnant lady with a problem as she is betrothed to a powerful man but her gravid status is due to another man and in this according to her, the Casanova came during the day which adds another twist to her sordid tale. Balthasar helps deliver the pregnancy against the advice of his Lightborn friend & neighbor Floria White Hand who's also an assassin. Tercelle leaves her twins as they remind her of the illicit liaison & also because they have an anomaly. Telmaine meets Ishmael at a ball wherein both of them get introduced to each other & possibly get an inkling of each others capabilities. Ishmael is also present to meet with Telmaine's cousin, Archduke Vladimer who entrusts him with a mission which could be perilous to say the least & even fatal. Telmaine & Ishmael later leave together with Telmaine's daughters to reach their home wherein they come upon a brutally beaten Balthasar whose life is saved only by Floria's intervention. Before leaving the assailants capture her elder daughter & demand the twin boys as a replacement for the girl. Alison Sinclair then entwines these two separate strands to give us a well paced story with a rather unique twist on the Light-Dark motif. The story does have a love triangle featuring the protagonists of this book which might be further explored in the remaining books of the trilogy. The author has thought out some intriguing anatomical facts based on the affinity or aversion to light about which I will be trying to get more from the author in a forthcoming interview. I am intrigued especially about the sightless of the Darkborn and they being able to perceive their surroundings by "Sonning" which I guess is a type of sonar ability. "Darkborn" is not doing something new in the genre; however it does provide some new twists on the fantasy tropes by adding a biological perspective in the magic involved. The author writes in very clear prose which makes the book a fast & enjoyable read. I quite liked the opening salvo in the world created by Dr. Sinclair & will be looking forward to Lightborn next year; hopefully most readers will also feel the same after reading this fantasy effort. Note: I want to express my thanks to Rosanne Romanello, ROC publicist for Ms. Sinclair who was very helpful in getting me the review copy of "Darkborn"
When I see the cover I think of Drucilla from Buffy/Angel. I can't be the only one who thinks that. When I edited the review the book attracted my attention since it escaped me too when published and I got a copy and plan to read it soon since it starts well. The book cover is very captivating & might be 1 of the protagonists involved. Alright, another book off FBC for the inexhaustible list.